In 2017, local artist Jonathan Green began a partnership with Charleston to Charleston when he appeared onstage with Booker Prize winning author Ben Okri to give one of the most talked about presentations of the entire weekend. For the 2018 festival, Green offered another type of partnership: a glimpse of the local aesthetic with his painting, Charleston Colors. 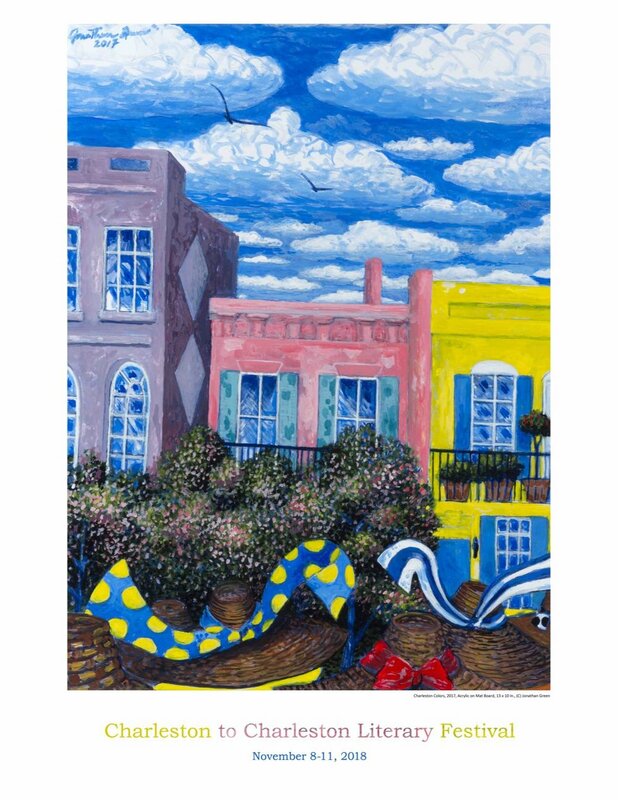 The poster, featuring Green’s vibrantly colorful, stylized version of Charleston row houses, will add a touch of Charleston’s iconic charm to the literary festival as it enters its second year. Posters will be on sale at all Festival venues in November. Signed posters will be available for $50, while unsigned prints will be sold for $25. For more information about the festival or the poster, email leah.rhyne@charlestontocharleston.com. Noted art critics and reviewers consider Jonathan Green to be one of the most important painters of the southern experience. His work, which has been exhibited in major venues nationally and internationally, reflects an intrinsic sense of history and place. Green has received numerous honors and awards for his art, social, civic, academic and cultural contributions. He serves on the International African American Museum, Gaillard Auditorium Boards, and many cultural advisory committees throughout the south. In recent years, he has combined his role as artist with co-creating the Lowcountry Rice Culture Project, which builds partnerships to explore, reveal, and reclaim the shared cultural inheritance of the Lowcountry rice industry. He currently resides and paints in his studio located in Charleston, South Carolina.